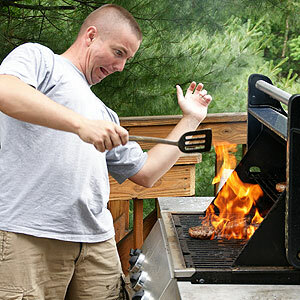 Is your BBQ Grill Safe? With increased Americans lighting their grills than previously, it is vital that you keep in mind a enjoyable grill is a safe grill. These grill safety guidelines were created to show you about the precautions necessary when grilling. Don’t forget, anytime you work with fire, there is a possibility that you will be burned. Thus, take these precautions to heart, preparation and common sense will prevent incident. Contact the Texas Grill Master with any questions. Bbq grills are made for outside use, solely. Never grill in your trailer, tent, house, garage, or some enclosed space because carbon monoxide may collect and kill you. Set up your grill in an open place that’s away from overhead, combustible surfaces, buildings, dry leaves, or brush. Make sure you avoid high traffic areas and constantly grill in a well-ventilated place. Be mindful of windblown sparks. When employing a BBQ grill, make certain that elements of the unit are firmly in place and the grill is secure (can not be tipped over). Electric wires ought to be put out of the way of paths or anyplace people can trip over them. Keep the fire in order. To put out flare ups, either lift the grid the food is on, spread out the coals equally, or adjust the controls to reduce the temperature. If you need to douse the flames, try using a light spritz of water in the grill. In the event you do not have a commercial extinguisher, a pail of sand or a garden hose should be close. These heat resistant pads are often made from plastic or lightweight, composite cement and can safeguard your deck or patio. Do not permit anyone to play or be near the grill when in use or promptly following its use. The grill body stays extremely hot up to one hour after being used. Never try to transfer a hot grill.